There is no substitute for the amazing interaction between a live band, music, and an audience (and no better way to get people to dance!) Their musicians have played every function you can think of, from Broubon Street clubs, festivals, and convention events to weddings and Private parties. 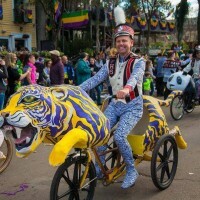 Tricycle powered mini-floats are made from 100% landfill rescued materials and have been featured in dozens of local Carnival parades as well as movies and commercials.